Yesterday, the Braves traded noted bad baseball player Alberto Callaspo and some spare parts for Atlanta heart-breaker Juan Uribe and RHP Chris Withrow. 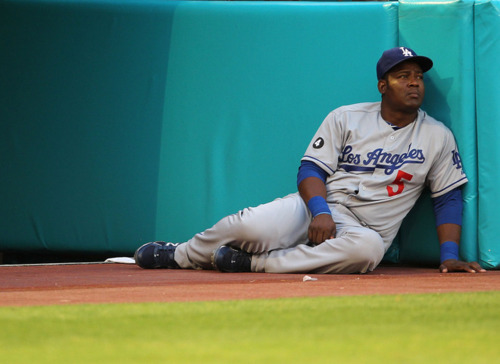 We don’t need to talk about who Uribe is. Sometimes he is sad. Sometimes he makes me very sad. What he is a fairly useful baseball player who plays decent defense despite a rotund frame who has amassed almost 9 WAR over the last two years. He is also uninteresting. Unlike the second piece coming back in this trade, RHP Chris Withrow. A former first round pick of the Dodgers in 2007, Withrow broke into the majors in 2013 and has thrown 56 innings. He’s been relatively effective, with a lot of BABiP luck (.209) and a high strand rate (82.1%) supporting a 2.73 ERA, with a fairly average 3.65 FIP. If you look at his raw stuff, he seems destined for high leverage spots in the back end of the bullpen. He can ramp his fastball up to 97-98 MPH, and he supplements the heat with a 90-ish MPH slider and a high-70’s curve. This combination of velocity and ability to change speeds has led to a lot of strikeouts. Withrow’s 31.7% K% since his debut ranks him 13th amongst all relievers who’ve thrown at least 50 innings since 2013, and he averages well over a K an inning (11.41 K/9). Withrow’s pitch selection, locating, and sequencing explains some of his success. He accumulates a lot of his strikeouts with his slider, especially down and out of the zone to same-handed hitters. This leads to quite a few fly balls–less than 40% of his balls in play are of the ground ball variety. However, more fly balls suppresses BABiP. Not to a .209 career mark, but most guys who are as fly ball prone as Withrow tend to put up BABiPs around .260-.280. Furthermore, he seems to limit hard hit balls. His 19% LD% is in the lower 30% for the roughly 250 relievers who’ve thrown as many innings as he has since 2013, and in terms of quality of contact against, he is middle of the pack for medium+hard hit percentage. TLDR: his stuff is great, it’s hard to hit, and if you do hit it, good luck hitting it squarely or doing much with it. However, the challenge for Withrow is usually getting his stuff close enough to plate to interest hitters at all. I admit to having irrational love for hard throwing relievers with wipe out stuff and zero control. My years-long crushes on guys like Craig Kimbrel, Kenley Jansen, Greg Holland, and Kelvin Herrera speak to this. Control can be taught, while raw talent can’t. Withrow fits the description of talented-but-wild as much as any of those guys, and may be the ultimate bullpen reclamation test for Roger McDowell. With successes like Kimbrel and Eric O’Flaherty, McDowell has a track record of fixing shaky command, and the challenge will be made a bit harder as Withrow recovers from Tommy John surgery. As well as Withrow compares to his peers in terms of nastiness and raw stuff, he looks really, really bad in one area in particular: walks. Revisit the heat maps from above, in particular the fastballs. 56% of those fastball are in the upper half of the zone, yes. Also of note: only 41% of those fastballs are in the zone at all. His overall Zone% sits right around there at 43%, and any given year, only 20 or so relievers pitch enough innings to qualify while throwing so few pitches in the zone. The guys who regularly show up in that list are the Luke Gregerson and Sergio Romo types, who are spamming sliders 40-50% of the time, not guys like Withrow. His problems locating in the zone lead to some ugly numbers. His 13.8 BB% ranks 5th from last–244/248–amongst relievers who’ve thrown 50 innings since 2013. He’s joined at the bottom of the leader board by guys like Michael Kohn and Carlos Marmol. That’s not the most inspiring set of names. Despite the horrible control issues, a 3.60-ish FIP is still average, which speaks to the raw talent that’s there. But with McDowell and the history of fixing control, even at the Major League level, I really love the Withrow pick up. For those of you paying attention, there’s been a never ending line of mediocre relievers called up from Gwinett this year. There’s a dearth of big arms in the Kimbrel/Venters mold, and it’s unlikely we luck into yet another uber-successful Moylan/O’Flaherty/Ligtenberg type (Brandon Cunniff may very well disagree, but I’m unconvinced). Withrow provides future depth and a huge arm at a position without a long-term plan. He already brings big strikeout numbers, and he’ll have plenty of time to work with the staff given his rehab from surgery and the Braves not being in contention. I like Chris Withrow, and the cut of his jib, and if he even cuts back the walks a little, I would not be terribly surprised to see a couple Venters-esque, sub-3 FIP years.